Visit the Albany Heritage Park for living history! Click here for a Map of Historic Places in Albany. The port city of Albany is located in the Great Southern region of Western Australia, some 418 km SE of Perth, the state capital. Albany, is the oldest permanently settled town in Western Australia. 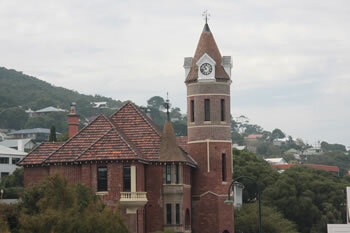 With Mount Clarence to the east and Mount Melville to the west, Albany city centre is at the northern edge of Princess Royal Harbour. There were several European explorer visits to the Albany shores prior to British settlement. The dutchman François Thijssen in 1627, in 1792 the Frenchman Bruni d'Entrecasteaux, In 1801 Englishman Matthew Flinders and in 1826 Frenchman Dumont d'Urville in the L'Astrolabe visited King George Sound. Click here for an overview of Albany Australia's Museums. 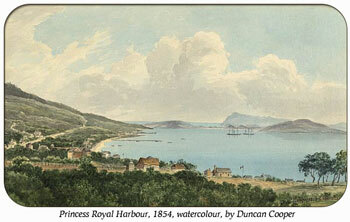 In 1826 Major Edmund Lockyer arrived on the Amity, from Sydney, and founded a British military outpost. This was to stop any plans by the French to claim Western Australia. Albany was named by Governor Stirling in 1832, at the time that political authority passed to the Swan River colony. The official postal service began in 1834 and the first town jetty was established in 1837. The construction of the railway in 1885, between Perth and Albany brought with it more settlers and more opportunities. The 1890's gold rush brought more settlers and prosperity. During this time many of the historic buildings on Stirling Terrace were built. Atop Mount Adelaide is the Princess Royal Fortress Military Museum. It houses the Albany Barracks & The Princess Royal Battery, the Military Heritage Centre, the Ellam-Innes Collection (extensive collection of War memorabilia of the 11th Battalion and 10th Light Horse regiments), Underground Magazine, Repository Store and Caretaker's Cottage, Artillery Display, Torpedoes, HMAS Perth trail, World War II Control Bunker plus more. On top of Mt. Clarence there is a memorial to the Desert Mounted Corps. The Brig Amity (1826). Replica (1975). The Old Post Office (1834). Albany Convict Gaol & Museum (1852). Albany Co-op Store Museum (1870). 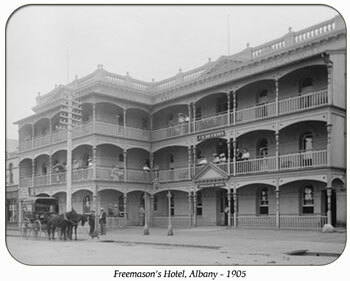 The Royal George Hotel (1885). Princess Royal Fortress Military Museum (1893). Visit the National ANZAC Centre or Desert Mounted Corps Memorial. Today the city of Albany is a thriving port city home to over 30,000. It is a significant tourist destination for Australians and International visitors. It has great significance historically and its coastline is a place of outstanding & spectacular natural beauty. Visit the Albany Museums Page for more on Albany's exciting history. Albany's Living History Tap the markers for information about the locations on the Map below.